Here's the section of the site devoted to my rambling about my love affair with the 605 - the little feets-mac, and just about everything about it. If you don't want to read about a grown woman romanticising a piece of computer hardware, run away now. Else, just read on for a little break from the technicalities of the rest of these pages. My first contact with the pizzabox shape came in the early 1990s, when I was an intensely loyal Amiga owner, and would engage in the typical platform wars against anything & everything non-amiga. It was the thing to do at the time (I -have- grown up now. No, really) and a few of the friends I knew owned Macs. Being young and poor, they'd often only use older black & white machines - SEs, Pluses and the like. On a walk downtown with one SE-owning friend, during a stopover into the local Macintosh reseller, I noticed a little box sitting in the corner that looked particularly nice. "For a macintosh" I added mentally, of course. That was the original model LC, and my appreciation for the shape stayed on. Fast-forwarding to 2000 I was, surprisingly, still using my aged Amiga 1200. 50Mhz of 68030 had travelled well, and while it did fine for email and telnetting to my favourite chat places online, the graphic abilities were getting further and further behind, and web browsing was only for the most necessary sites - even then, only if you didn't quite expect to see pages as they were intended. Now, simply by the content of this site you should be able to tell I'm one for getting the most out of old hardware, and while the Amiga still did all it could in 1992 and more, I wanted what the new machines had. That's all kind of irrelevant though - If I sounded like I was winding up to where I bought a Mac, I wasn't - I spilled coffee in that A1200 in June 2000, and firmly killed it. Ugh. No computer, no net access, no playtoys - I needed another machine and my sister Lyn saved me!. She'd bought a Powermac 8100/80 second hand, which didn't QUITE work as it should. It would occasionally boot to a sad-mac, or crash mid-use... and using external SCSI devices just left things far too unstable. So there I end up with my first Macintosh!. Since my first meeting with the LC years before, I'd actually worked in prepress and photomanipulation with powermacs and photoshop, so I knew them both well. It wasn't all a complete shock to suddenly be using a Mac. Now to where I *did* buy a Mac of my own. The 8100 was (and still is) a lovely machine, but since I was so close to something modern, and had the cash spare, in early 2001 I bought myself an iMac 400. Oooh a reliable little box that one is - it's what I'm typing this on now under Mac OSX. The Mac addiction had started to grab me tightly already, and after an experience with a Classic II at work (setting it up as a donation machine for students with no wordprocessor access of their own) I bought a Classic II of my own, from eBay. Then came my first LC - an LCII!. 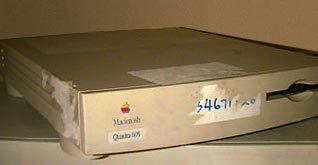 Another month later and I had an LC475 - the consumer brother to a Quadra 605, identical in all but looks. Now I was surrounded by Macs, including a few of my beloved Pizzabox shaped LCs - and then I fell in love. Looking around online, I found a Japanese site devoted to the pizzabox obsession, and sitting on one of their pages was a photo of a Q605. At the time I barely knew what one was, but the shape grabbed my attention. It had the flat slim lines of an LC, but without the visual clutter of so many air holes. It stood flat instead of tipped up, and the front curved softly... just begging to be stroked. And it had those utterly gorgeous FEET propping it up. I had to have one! My next eBay purchase was a 605 from Canberra, which arrived in the filthiest state! Covered in auction stickers, felt-pen marker and general grime, it looked a mess - but it was as cute in real life as it looked online. After a good scrubbing & bleaching, the case turned out to have none of the feared yellowing that most of Apple's plastics get after years of exposure to light. Everything worked fine, and with 16Mb RAM and a little 250Mb HD, I was up and using the computer I've loved more than any other I've owned. Since then I've bought 3 more 605s, one of which is propping up my iMac, one is working as a scanning station, one is serving these pages to you and the other just sits there looking good. So enough about me and the aesthetics of the microquadra, how about the rest of the design - the function. I'm glad to say the little boxes hold up pretty well. Released at the end of the 68k-only era of Macintoshes, they were both the cheapest Macs yet made, and one of the most powerful. Lacking only an FPU, their 25Mhz worked well, official Apple RAM expansion allowed for a whopping (at the time) 36Mb, and as with all Macs at the time, just about any low-profile SCSI drive could be used. Being a cheaper model, expansion options were limited to just the one 68030-Compatible PDS slot - given the 3-year history of LC PDS cards being manufactured for these well-selling machines, plenty of cards existed to do various little extras. Perhaps the most important current use for a PDS card is an Ethernet adapter. They're cheap and everywhere. The physical layout inside the case is phenomenal. As much as a 605 is 'only' a low-end Quadra, the box itself (and that of all its pizzabox LC cousins) is one of the most well-designed pieces of hardware I've come across. The entire top unclips in seconds, and inside every component is laid out in a plane - nothing is above or underneath anything else, there's no remove-the-HD-before-the-motherboard-comes-out nonsense. The best feature however - no screws on the inside. Everything clips in or out all the way from the speaker & floppy drive, to the motherboard & power supply. These boxies are a dream to work on!. Are there any negatives, or am I looking at these things through biased eyes?. Yes... there are problems. Q605s were the only Quadra to have no option for onboard ethernet, and for all my uses, that's pretty much mandatory - adding ethernet uses up the one valuable expansion slot. Just having the one slot is another bugbear - Even having just one more would be wonderful. An extra RAM slot for flexibility wouldn't go astray either - having to use one 32mb SIMM when I have plenty of 16 and 8mb ones around just feels a little of a waste. The FPU-less 68LC040 is a small gripe as it's easily fixable with a transplant from another less popular Quadra. In the end, the lil 605 is what it is however - A very well designed, pretty little desktop computer, with all the speed of a normal Quadra and enough flexibility to play play play. And being almost 10 years old now, that's what they do best.